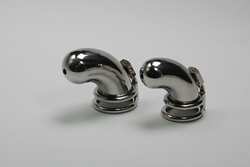 Chastity device model "Bend tube"
This chastity device is shaped as a bend tube with a round head. At the end of the head there is e hole for urinating. The tube is connected with the cockring and cannot rotate. This chastity device is made for medium long chastity games. All parts are highly polished and has no sharp edges. The device is locked by a padlock, included.